The International Red Cross has declined to participate in Washington’s controversial humanitarian aid plan to Venezuela, it was announced this weekend. The assistance, which is being coordinated by Venezuela’s self-proclaimed president, Juan Guaido, and the US Agency for International Development (USAID), is reportedly comprised of US $20 million worth of medical, food, and personal hygiene supplies which are currently being warehoused in the Colombian border city of Cucuta. The Venezuelan government has denied USAID personnel entry into the country, claiming that the aid is being used as a cover for a foreign intervention to install Guaido in Miraflores presidential palace. The Red Cross currently provides medical assistance to a number of Venezuelan hospitals under pre-existing and recently expanded international agreements with Maduro’s government. On Wednesday, ICRC President Peter Maurer told reporters that the body will be doubling its budget to assist the Venezuelan government in countering the effects of the deep economic crisis. “Our focus is really to, on the one side increase our response to Venezuelans, and on the other hand to keep away from the political controversy and political divisions which are characteristic to the crisis in Venezuela,” Maurer told press in Geneva. Meanwhile, the United Nations has likewise raised objections to Washington’s “politicised” aid plan. “Humanitarian action needs to be independent of political, military or other objectives,” UN spokesman Stephane Dujarric told reporters in New York last Wednesday. UN spokespeople have also recently vowed to increase the budgets of current aid programs carried out in coordination with the Maduro administration. He also pointed out that the reported $20 million in US aid pales in comparison to the estimated US $30 million per day the new US oil embargo will cost Venezuela this year. On January 28, US National Security Advisor John Bolton unveiled the latest round of economic sanctions prohibiting corporations under US jurisdiction from purchasing oil from Venezuela’s PDVSA state oil company, which he said will deny the company US $11 billion in revenues in 2019. Bolton also announced a freezing of Houston-based PDVSA subsidiary CITGO’s assets, which are valued at US $7 billion. Fears of a direct military intervention in Venezuela have grown in recent weeks after both US President Donald Trump and opposition leader Juan Guaido refused to rule it out. Adding to these concerns, Venezuelan authorities announced that they confiscated a cache of illegal firearms they say were smuggled into the country from Miami last Tuesday. The 19 assault rifles, 118 explosive charges, 90 radio antennas and six latest generation smartphones arrived on a Boeing 767 cargo flight from the 21 Air company to Valencia airport. Maduro has ordered a reinforcement of border security in response to the increased threats, with the armed forces loyally executing his order not to let the USAID personnel enter the country. He has also been under attack this week following the circulation of a picture of the Tienditas bridge connecting Venezuela and Colombia blocked by tankers, with international commentators accusing him of closing the bridge this week. The bridge was culminated in 2015 but was never opened due to border tensions between Venezuela and Colombia that flared up later that year. US establishment figures from both sides of the political aisle, including Vice President Mike Pence, former Vice President Joe Biden, and Democrat House Speaker Nancy Pelosi, have lined up to back the aid plan, denouncing Maduro for refusing to open Venezuelan borders and urging him to step aside as Venezuela’s leader. 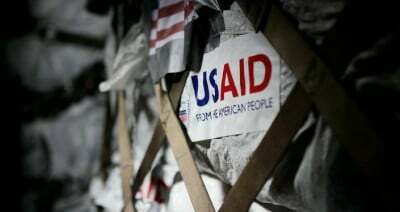 USAID is an arm of the US State Department and has been involved in a number of scandals in recent years which have led to its expulsion from Russia for political meddling and Bolivia for conspiracy. The press release explains that the plan is to supply Venezuelans with vegetable oil, flour, lentils and rice which they claim will feed 5,000 Venezuelans for 10 days. Also reportedly included in the shipment is ready-to-use food supplements for 6,700 Venezuelan children for two months and high energy bars for 10,000 children for one month. Equally, the US body says it looks to deliver a 10-day supply of soap, toothbrushes, toothpaste and other personal hygiene products for 7,500 Venezuelans, as well as emergency medical kits for 10,000 hospitals for 3 months. No details about proposed distribution plans inside Venezuela nor qualifying criteria for the aid were made public. Venezuela is entering the sixth year of severe economic contraction caused by a variety of factors, including collapsing oil prices, crippling US-led sanctions, as well as corruption and economic mismanagement.